What a difference a decade makes. 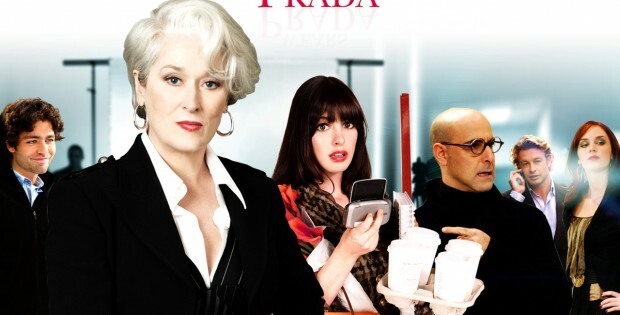 When it was released in 2006 The Devil Wears Prada was a vehicle for Meryl Streep to showcase her talent amid a number of talented people. A summer film set up as counter programming that managed to find a substantial audience, it wound up giving a lot of people exposure enough to launch them into full time careers. Now, with the benefit of a decade in the rear view, it was the beginning of the ascension of the careers of Anne Hathaway and Emily Blunt into top-lining status using the star power of one of the greatest actresses ever. Hathaway stars as Andy Sachs, a graduate of Northwestern University who comes to New York to become a journalist. But unable to get a job writing “meaningful” news, she naively applies to Runway Magazine, in hopes the experience will get her somewhere like the New Yorker. Problem is, she’s apparently fat and in need of a major fashion makeover, so how is she to survive? It’s odd to watch this a decade later and see where everyone in the cast has gone. Hathaway is an Oscar winner and A-list actress, Emily Blunt may not have an Oscar but she’s got nearly the status of her counterpart, Streep has three Oscars and the title of greatest actress of her generation firmly secure and Stanley Tucci is still everyone’s favorite character actor. Oddly enough Adrian Grenier, in a small role as Andy’s boyfriend, had a roller coaster of a career in the past decade as Entourage came and went. In retrospect this was a loaded cast in a number of respects; the next decade was very good to even Simon Baker, another throwaway role, as he became a star with The Mentalist. The film still holds up because the inherent story of someone trying to make it in a world entirely foreign to them. It’s interesting to see Hathaway here because her plucky earnestness is still endearing; she’s been able to harness what makes her insanely likable in this film into nearly every role since. It’s not great, nor is it very good, but it’s still insanely watchable. The problem is the DVD release is just a re-issue of the original without anything new. Considering that Hathaway won an Oscar, and rose to fame, in the decade since a retrospective on that (and this film’s launching of her career in earnest) would’ve been interesting. Unfortunately this is just the same DVD as before; there’s nothing new or interesting for a film that should have some new stuff on it. The extras are the same as in the original DVD release.